Here’s a quick lunch you can grab that’s loaded with protein, omega-3 fatty acids, B-vitamins, selenium, plus other minerals like magnesium, phosphorus and potassium. Just make sure you go out of your way to buy “wild caught” tuna and avoid farm raised. 1 Tbsp. healthy mayo, or coconut milk yogurt alternative. 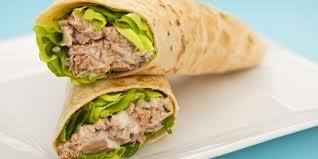 In a medium mixing bowl, combine tuna, dressing, celery, pepper and Mrs. Dash seasoning; mix well. Microwave the tortilla for 20 seconds to soften. Place cucumber slices on the tortilla. Top with the tuna mixture and tomato. Roll up tortilla, serve and enjoy! NOTE: Even though some tunas contain mercury, the high selenium content helps combat any potential for mercury toxicity. However, pregnant or nursing women should use caution and avoid tuna… when it comes to our little ones it’s always better to be safe than sorry.